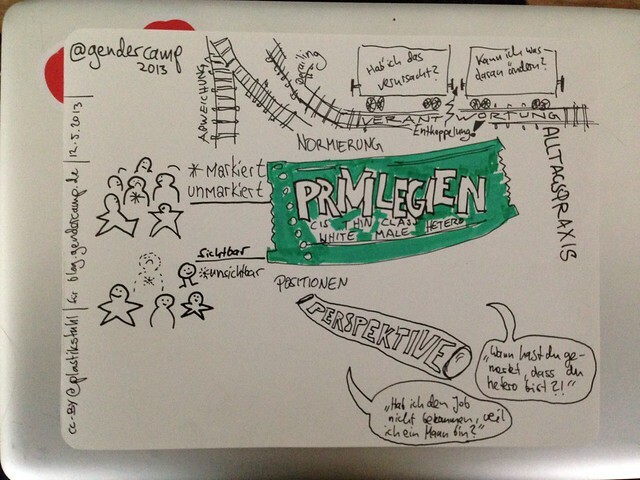 GenderCamp sketchnotes – my first attempt in visual note taking. 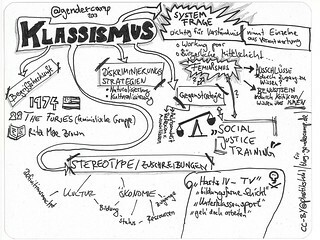 I’ve been always quiet impressed by sketchnotes which passed my eyes through my twitter, flickr and RSS from lectures, barcamp sessions or conferences. Those visual notes mixed from drawings, text, diagrams and structures appealed to me and gave me much more of an inside on the issue of an event which I missed than just some tweets and pictures or sometimes even full length blogposts. 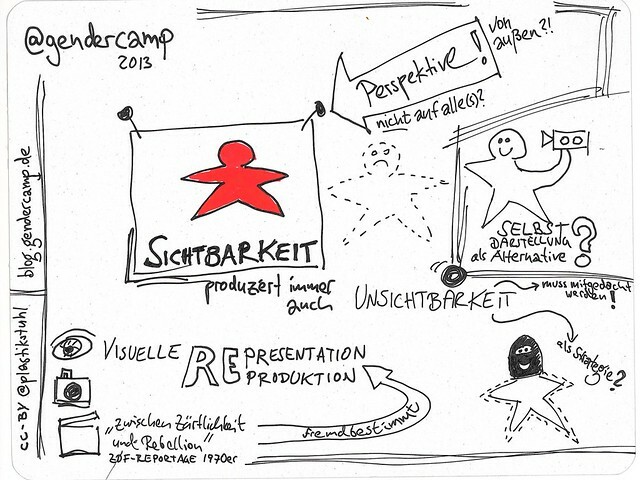 Having “I can’t draw” in mind (as many people, I guess) I never really considered to begin with sketchnoting myself. Although taking sketchnotes is much more about taking notes for oneself than visualizing something for others. That was until I watched the webtalk on #pb21 – a blog on civic education – with Ralf Appelt (@ralfa), one of the most frequent sketchnoters in my streams. This video finally encouraged me to try it myself and the first best chance to try it was GenderCamp 2013, a barcamp on feminism and internet culture and politics which I co-organize. 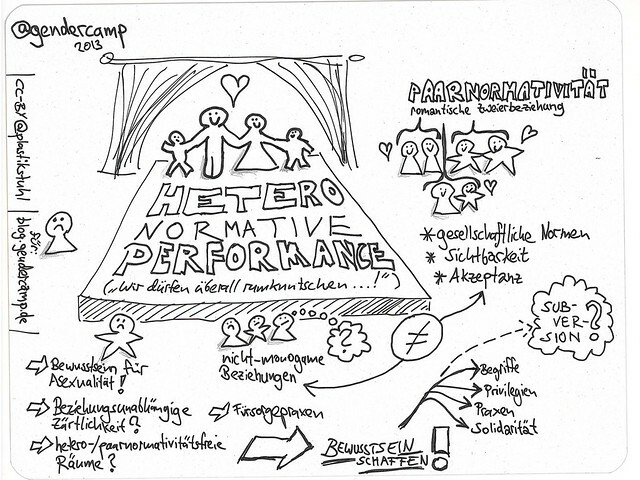 So in all of the gendercamp sessions, which I didn’t facilitate myself or where I wan’t in charge of the formal written documentation, I took some visual notes. Let me show it to you, before I conclude what benefit I got from creating those sketchnotes. Well, first of all it was a lot of fun. I haven’t just pushed away my allergy against dead wood a bit, but really enjoyed myself in taking sketchnotes during the sessions. I don’t know, if this is a first time phenomena, but I guess I’ll figure it out eventually. But besides that the greatest advantage I realized from taking sketchnotes was, that I was really focussed to the input – probably much more than usually. And that alone is reason enough for me to try it again (next week at [BarCamp politische Bildung / barcamp civic education)(http://bcpb.de). How can I prevent stereotyping and (in)visibility issues? Should I use more color? Do I take the effort to scan or do I just take a picture? Do I stick to one line strength or do I really need three for the basic text and drawings? sketchnotearmy.com – The worldwide community of sketchnoters. Hello Dear, are you really visiting this website regularly, if so afterward you will without doubt take pleasant experience.